It’s that time of year again! 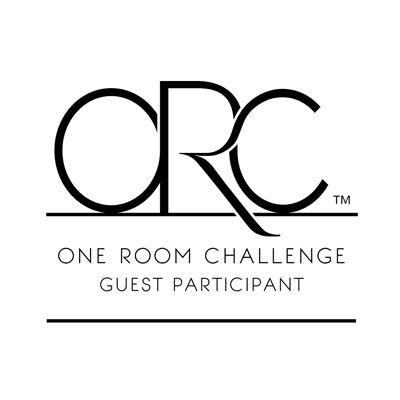 The One Room Challenge begins again today. This is a challenge for bloggers to take one room of their homes and make them over in six weeks, joining over 200 other bloggers in sharing their weekly progress at the host blog, Calling It Home, and on their own blogs. This is my third time joining in and I’m so excited to get starting on making over my kitchen. Last spring I took part and made over my living room. 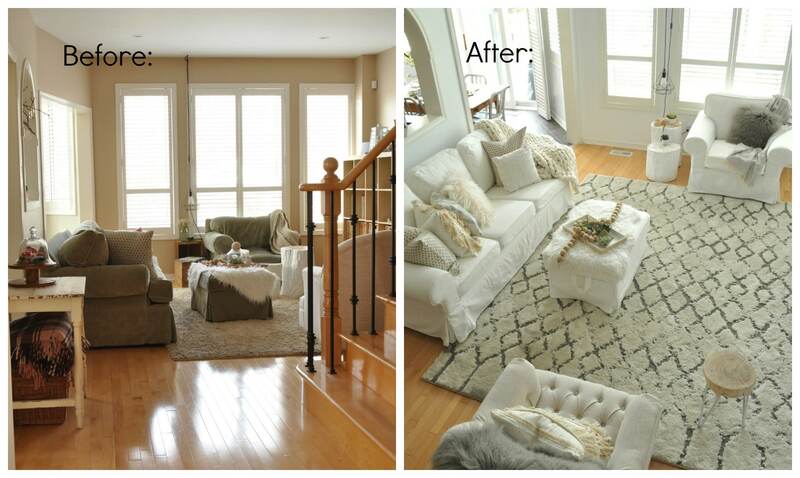 We went from a cozy but a little dated beige living room to a bright and airy Rustic Scandinavian inspired space. See the Living Room Reveal here. And, last fall, for my first One Room Challenge, I did over the dining room. 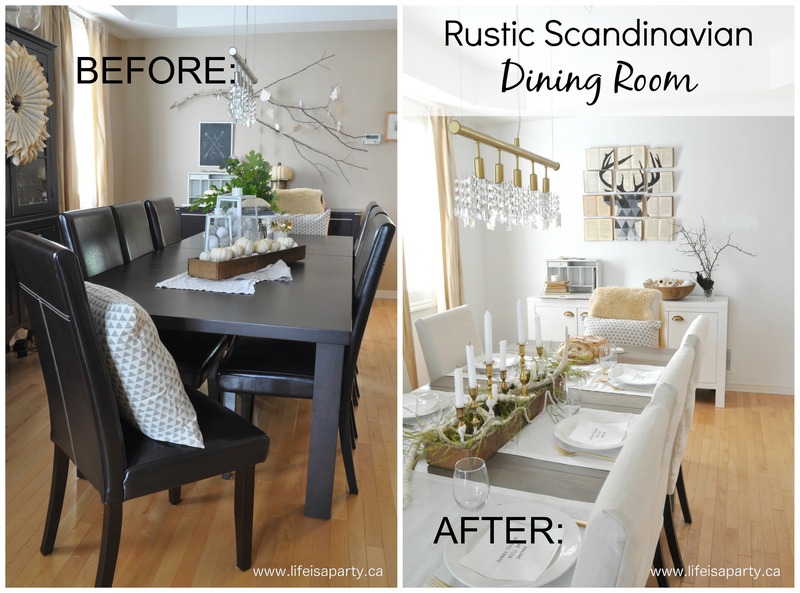 We went from a dark dated space, to white and open Rustic Scandinavian inspired space there too. See the reveal Dining Room Reveal here. The kitchen will be the last major living space on the main floor to be made over. Finishing this room will complete the transition to a bright, white, Rustic Scandinavian inspired main floor space. I love Rustic Scandinavian design. It’s often neutral with lots of white and some black, along with wood. It embraces the idea of hygge, and making spaces cozy and warm with lots of natural materials like wood, wool, ceramic, and bringing the outdoors in through things like pinecones, and branches. I’d say this look in many ways shares some similarities with modern farmhouse design, but is a bit more pared back, and minimalist. Scandinavian design is often very modern and cleaned lined -but I’d say my take is a bit more country influenced. The rustic piece is where my love of rustic antiques and junk shop finds comes in. I’ve found the design to be a really good backdrop for the blog as well. I find more and more I use my home as my studio and I need a neutral backdrop for entertaining, decor, and cooking. I can’t wait to be able to use my kitchen as a background to my food photography -haha blogger dreams. Here’s what the kitchen looks like now. It was this way when we moved in about 10 years ago. Not exactly what I would have picked even back then, but not so bad either. What I would have picked, and what we had in our previous home, was a white kitchen. 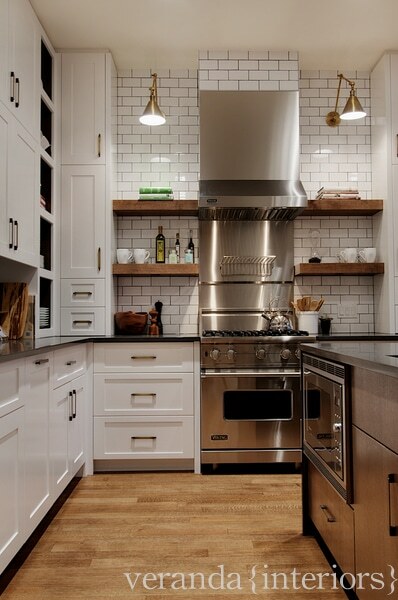 White kitchens are so popular, but they’re still my favourite. And and I have to say that for the whole 10 years I’ve been dreaming about having a white kitchen again. 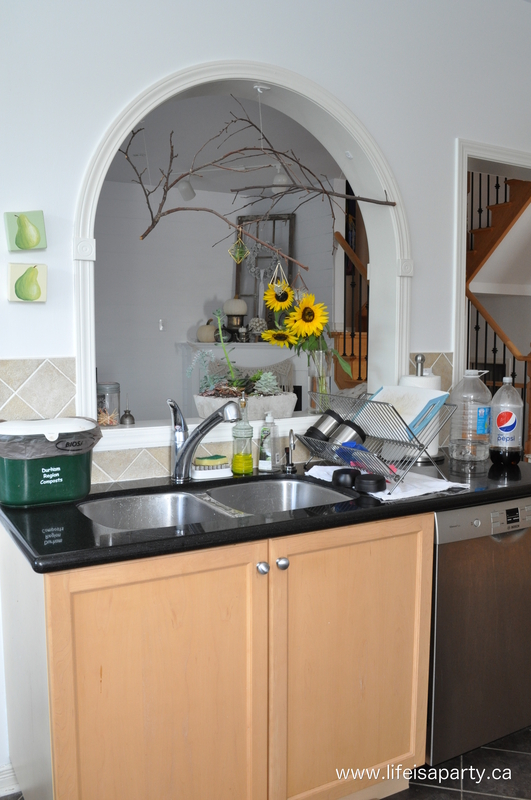 The existing kitchen is maple, with a black granite counter, and stone backsplash. The fridge and stove were brought from our previous house and we’ve had them since we got married 16 years ago. They are due to be replaced. The floor is a slate look tile. The light fixture is a builder basic and so is the kitchen faucet. I have to keep the flooring, and the cupboards. So this is definitely a makeover rather than a reno. 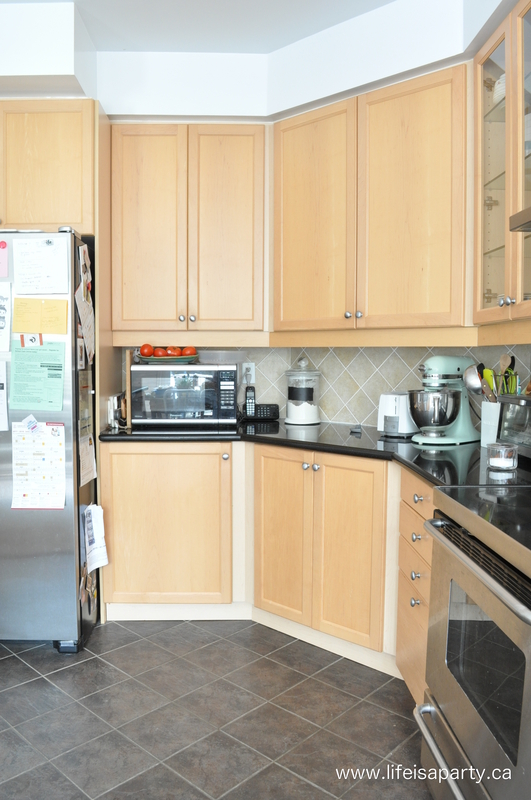 I looked into having the cabinets re-faced last year, where you have the doors replaced with white -or whatever you like, and the sides are recovered to match. I was shocked at the price; $8000 for my small kitchen. So this time around I looked into painting them. I was hesitant to paint them at first because I was worried about them chipping and looking worse than the plain maple. My husband had a friend who had theirs painted by a professional though and recommended it to us. It turns out professional painting comes with a guarantee against chipping and is a fraction of the cost of replacing them. Sold! So I get to have my long awaited white kitchen! Insert happy dance here. Since the counters are granite they have to stay too, so we’ll have a black and white kitchen -perfectly Scandinavian. Here’s some beautiful inspiration from Veranda Interiors. 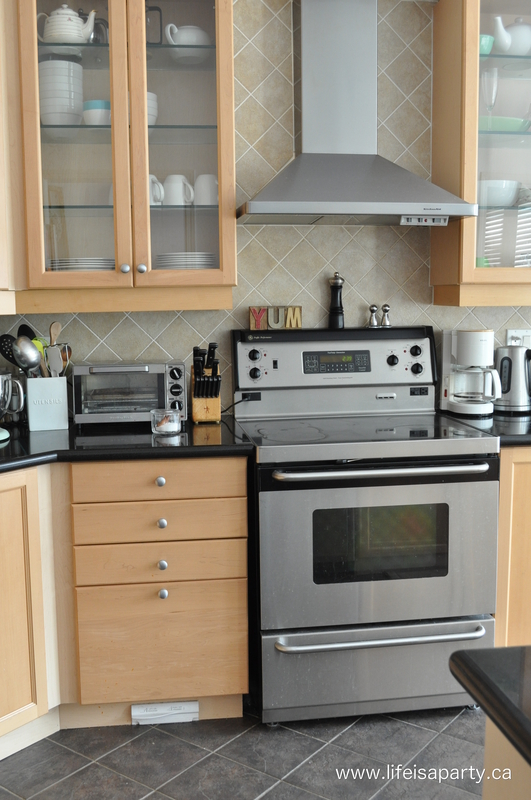 I love the white cupboards, black counters and open shelves. This mood board gives you idea of where I’m headed with the whole makeover. To see more of my inspiration follow me on Pinterest, and check out my Kitchen Board. I’m excited to add some brass and gold accents to warm up the space too. 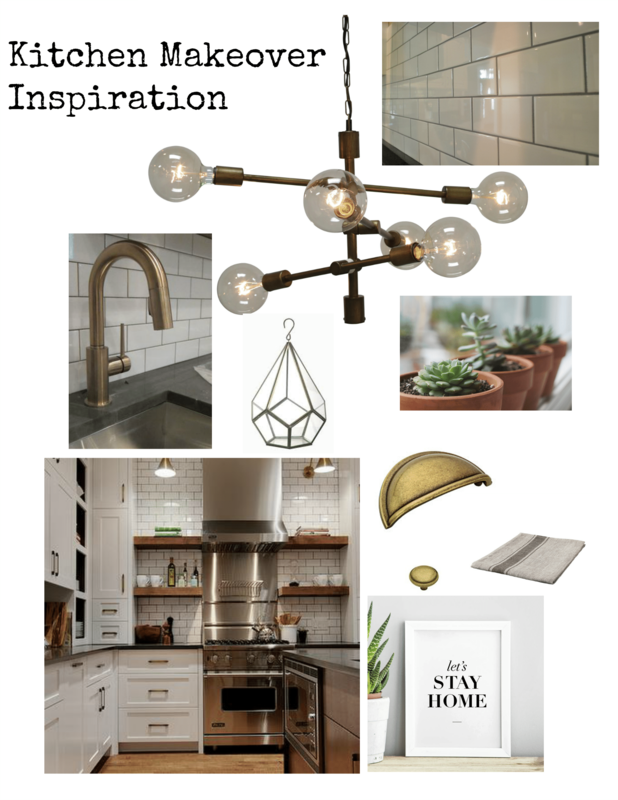 We’ll be adding brass lighting, cabinet hardware, and an amazing new kitchen faucet. I’ll be mixing the brass with the stainless steel appliances. The existing backsplash tile will be replaced with white subway tile. Subway tile is a real classic and the dark grout will help tie it into the black counters. The other big project is that I’m removing the glass cabinets on either side of the range and replacing them with open shelves and tile up to the ceiling. I’ve never done tiling but it’s a project I’m tackling myself -infact I’ll be starting to remove the old tile this week. I’m very excited to be partnering with some AMAZING brands for this project -be sure to follow along over on Instagram to see the amazing products as they arrive at my door on Instagram Stories. Does that seem like a big list of things to get done in six weeks? Writing it all down is making me feel that way too! But bit by bit, week by week it will get done. I’m excited to share my weekly updates with you here. Can you believe that in six short weeks we’ll be done! I’m linking up this post at Calling It Home where you can see all the other guest participants bloggers and their plans for their room makeovers too. I am working with some amazing brands on my One Room Challenge Kitchen Makeover, and I’m so grateful. I’ve received products or discounts, but as always, all opinions are my own. I’m so happy to be partnering with Home Depot, Wayfair Canada, GE Canada, Benjamin Woodworks, Lagostina, Smith Sprayers, Lee Valley Tools, Delta Faucet, Krylon, Minwax, and Hamilton Beach. With a new One Room Challenge project getting started, life really is a party! 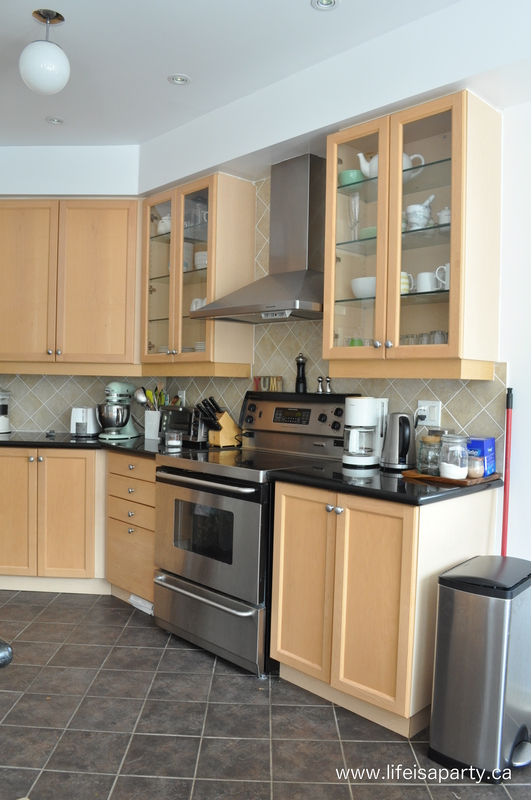 I guess maple cabinets were in style 10 – 15 years ago…though I never noticed. We bought out home 10 years ago, as well, and have cabinets in the same tone. I can’t wait to replace them with something crisp and fresh! Looking forward to your progress updates and reveal! I THINK PAINTING THE CABINETS WILL LOOK GREAT! Wow! I can’t believe how much of your home you’ve made over (within the ORC too!) It looks amazing. 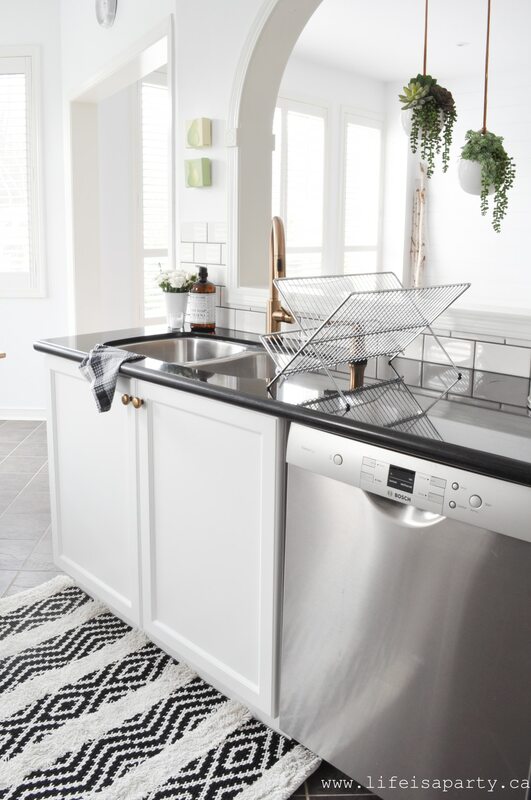 Can’t wait to see how this kitchen turns out – the plans look amazing! With just the primer it’s already starting to take shape! Best of luck with your challenge too. Thanks Leslie. Our makeovers are very similar, bring on the white! Looking forward to following along with you.